Harman-Kardon Go + Play 2 review | What Hi-Fi? Seldom has a product name sounded more like the title for a Ladybird children’s book, so appreciate the necessary self-restraint for us not to indulge in a twee introduction this time. Such saccharine opening lines wouldn’t really befit the Harman Kardon Go + Play which is not only a powerful wireless speaker, but is also built like a kettle bell. You’d expect power from a unit so wide-set, boasting front and rear-firing 9cm woofers as well as a pair of forward-facing 2cm tweeters. When the Go + Play is plugged into the wall, each speaker can be pushed to 25W. What you may not expect, however, is for it to be portable. You probably aren’t going to be carrying the Go + Play around in your duffle bag, but its rechargeable battery is capable of up to eight hours of playback and it can juice up your phone or tablet via USB, making it ideal for that summer garden party. In fact, we gave its predecessor four stars in 2013. However, back then it stretched the definition of portable somewhat, requiring a whopping eight D-cell batteries. Although it's mildly disappointing to discover it has no wi-fi or Bluetooth aptX compatibility, there is a 3.5mm jack for when regular a Bluetooth connection is not enough. 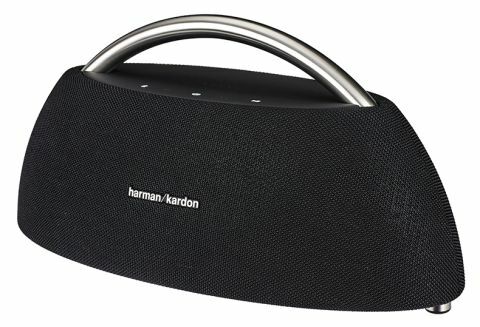 You can connect any pair of Harmon Kardon Wireless Dual Sound speakers to it, too. The advantage to having so few features is how simple it is to set up. Press the Bluetooth button on the speaker, pair your device and it will pick it up when both are turned on. Sounds like a given, but test as many wireless speakers as we have and you’ll know things aren’t always so straightforward. Opening up Tidal, we head for Manchester Orchestra’s Hope album, which the Go + Play eats up like a weight-watcher at breakfast. These types of arrangements, slender in their instruments yet rich in texture, are rendered wholesale, regardless of the volume. That isn’t to say the Go + Play is unable to dispense music with detail, delicacy or nuance. Andy Hull’s voice is tinged with vulnerability, despite his otherwise bold delivery, and dynamically the Go + Play is well within its comfort zone, tenderly tracking each song. When you arrive at a track such as Trees, things become more interesting still. The depth of the bass frequencies recovered from those organ pedals is extraordinary. Not only because the Go + Play is can reach so low but because it doesn’t muck up the rest of the mix. Piano and strings have room to breathe and none of Hull’s vocal is hidden. The bass may be marginally overpowering for some listeners, especially if you’re placing the speaker on a rickety table or up against the wall, but it doesn’t skew the balance unnecessarily. That remains the case when we try The Blood Brothers’ album … Burn, Piano Island, Burn. The weight is still present in bass guitar and drums, but Harman Kardon hasn’t allowed the treble to be rounded off, keeping the record’s unruly ferocity clawing at the bars of its cage. That energy is also a product of great timing. If you split hairs, there are speakers at this price that are more agile or light-footed, but you’d be sacrificing the Go + Play’s muscle that gives the music such impetus. In that sense, does the Go + Play have a natural competitor? Possibly, in the shape of the portable, boom-box-style Audio Pro Addon T3. However, at two thirds of the price of this Harman Kardon, that is aimed at a different sector of the market. Compare the two and the T3 is more delicate, the Go + Play more expansive and much more powerful. If you were deciding between the two, it comes down to budget, space and how much muscle you feel is necessary. In terms of pure talent, though, it's more or less a dead heat. We enjoyed this speaker’s predecessor enough to give it four stars, and you can tell the latest Go + Play is a product of the same gene pool. But this generation has added the finesse that was once lacking, making it an even better proposition. If you want a powerful but portable wireless speaker, and this fits your budget, then this is where to spend your money.